This place is a great vegetarian cafe option and has delicious raw deserts too. All with a rice field just across the road. 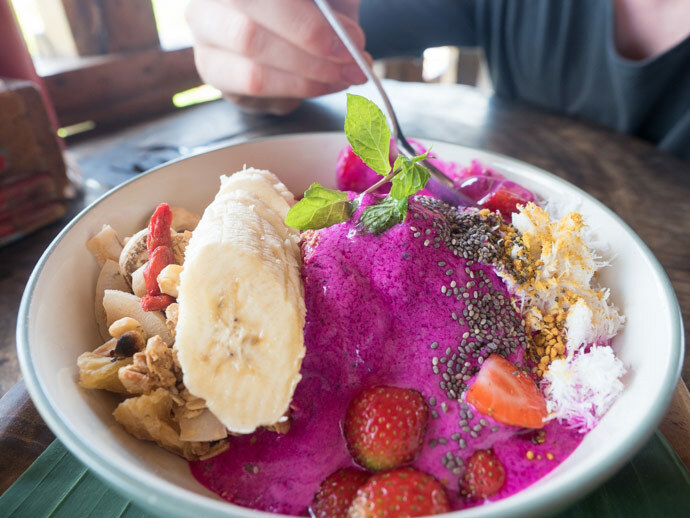 Betelnut Cafe is a popular cafe in Canggu for good reasons, it serves delicious and healthy food for breakfast, lunch and dinner. 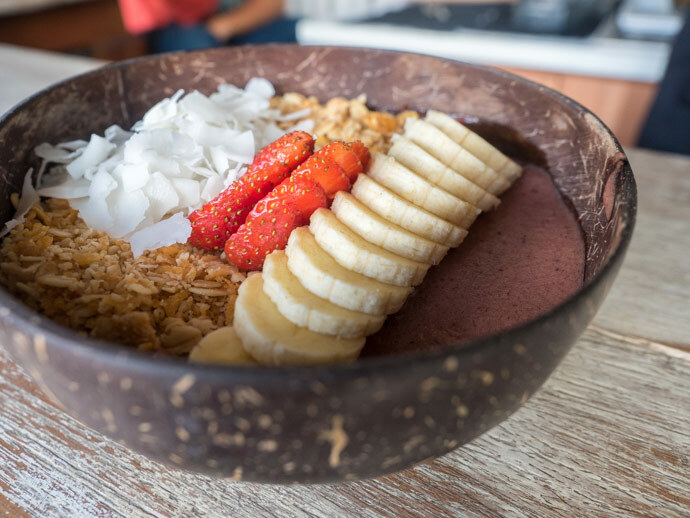 A must try is the ‘Naga Bomb’ – think dragon fruit smoothie bowl… it’s sublime. 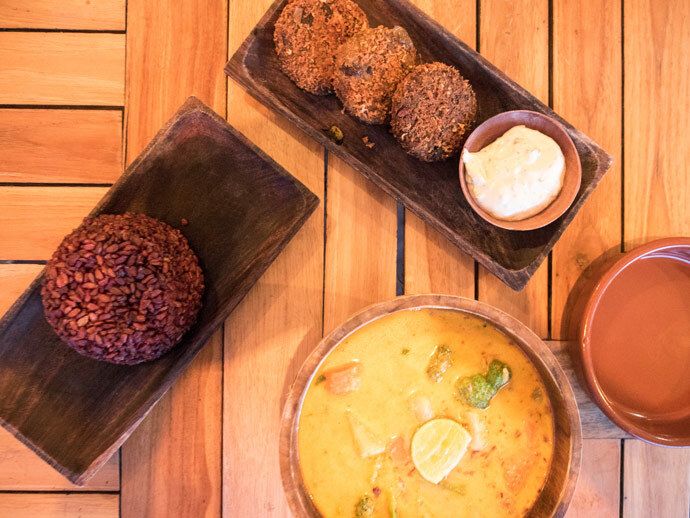 One of our Canggu favourites. 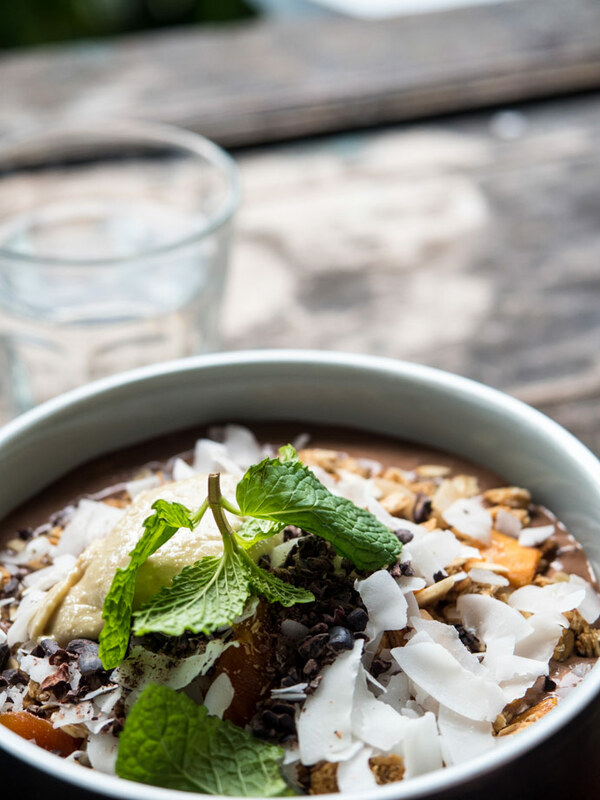 Burgers to Smoothie bowls, Ruko has you sorted with deliciousness. 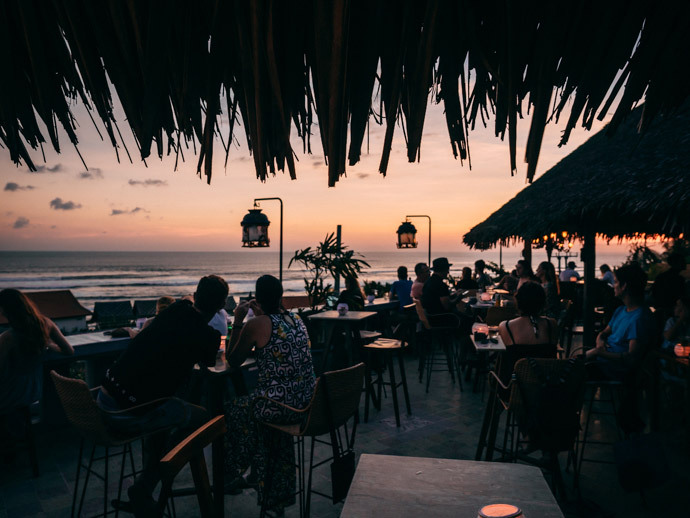 Ji Restaurant Bali consists of two parts, Ji at Bale Sutra, a temple from 1706, and Ji Terrace By The Sea, which has stunning views over the ocean. 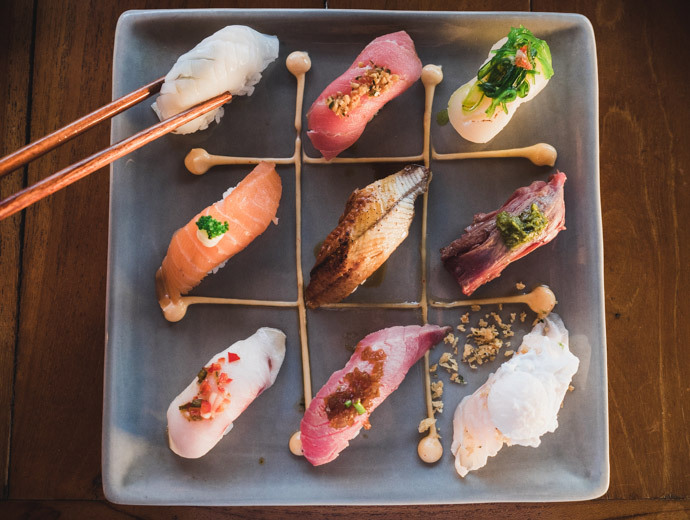 Here you will taste delicious contemporary Japanese cuisine, including sushi, nigiri, maki rolls, noodles, main dishes and salads. They also have Asian inspired cocktails that are perfect to have whilst enjoying the sunset. 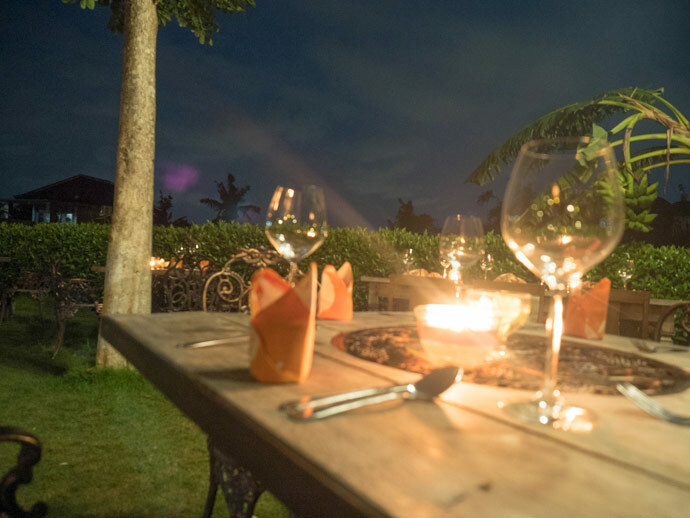 We loved our experience having dinner and watching the sunset at Ji Terrace By The Sea. 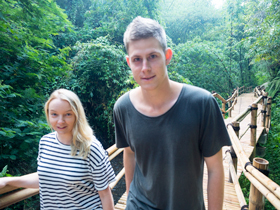 Honestly, this was one of our favourite experiences we’ve had in Canggu. 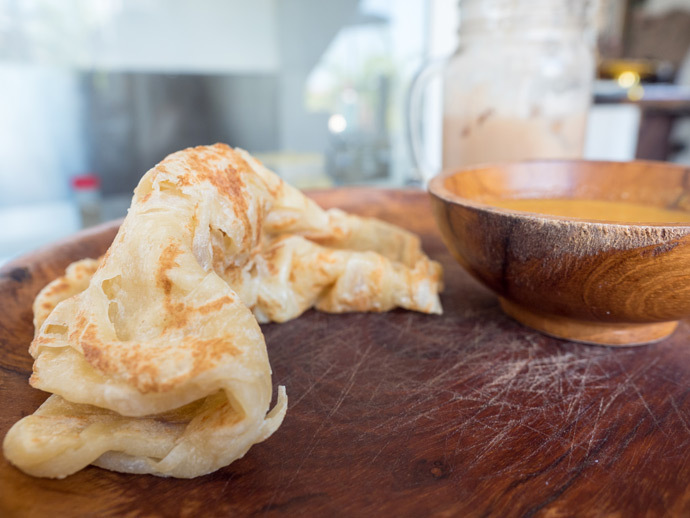 I’m going to admit it, Roti is one of my absolute favourite foods, so when I found out about ‘Roti Canai’, there was no question if we were going. The Roti and curry were both great, oh and the Teh Tarik (stretched milk tea) is a great way to top it off. 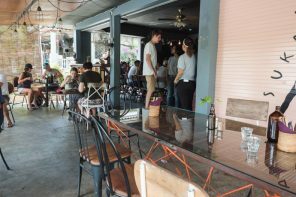 Crate cafe has laid back surfy vibes that draws the hipster crowd. 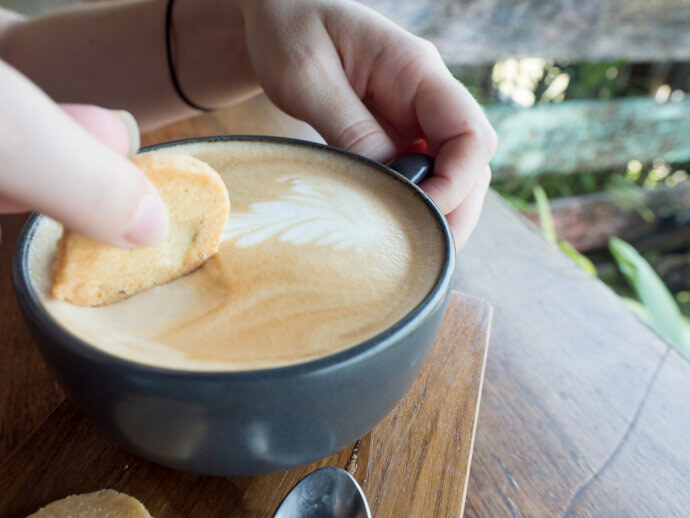 With a focus on breakfast and coffee, it’s the perfect way to start your day in Canggu. 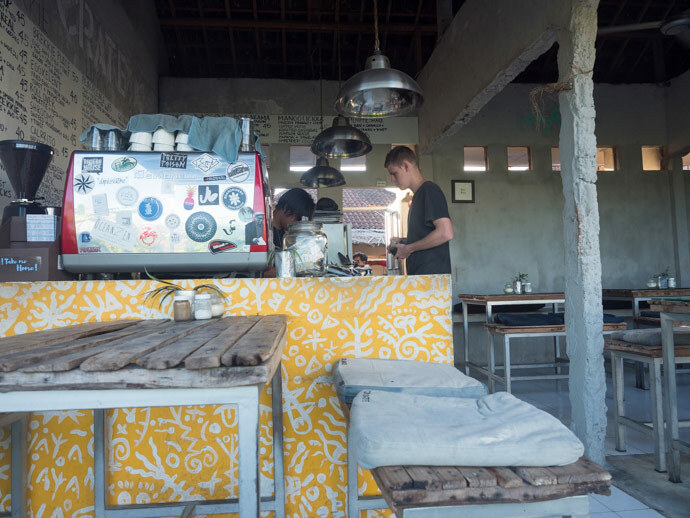 This place offers something different in Canggu. 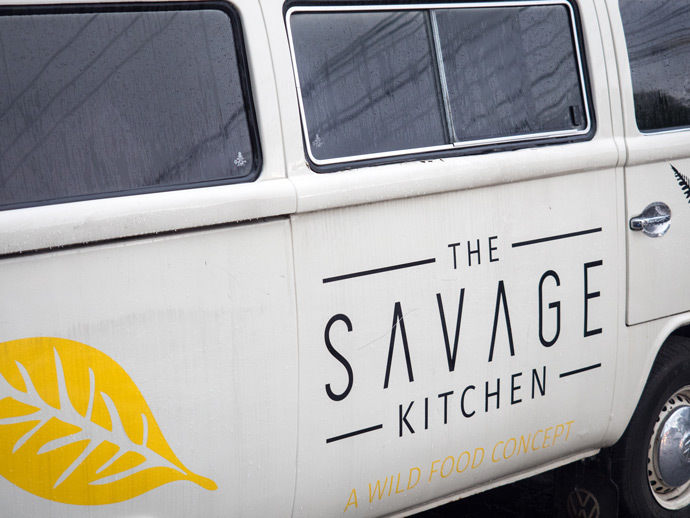 A healthy wild food concept. 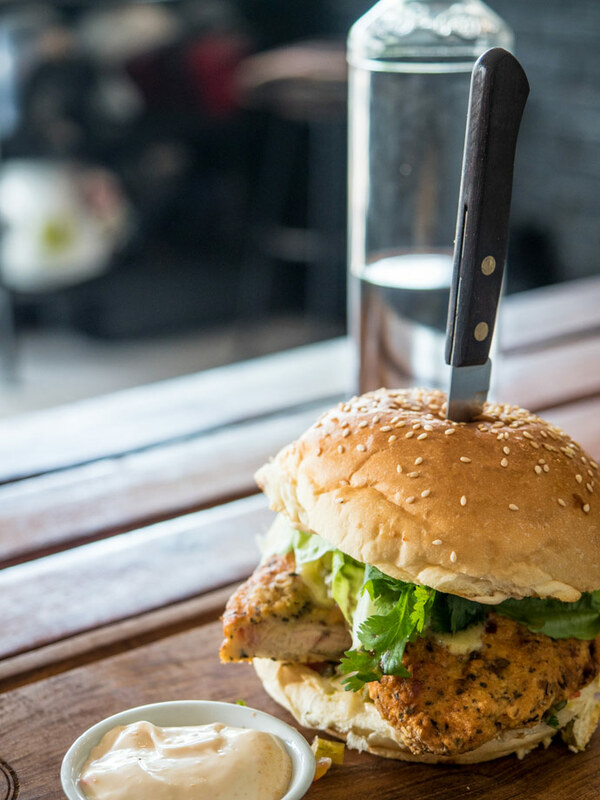 Locally produced and sourced food done well. 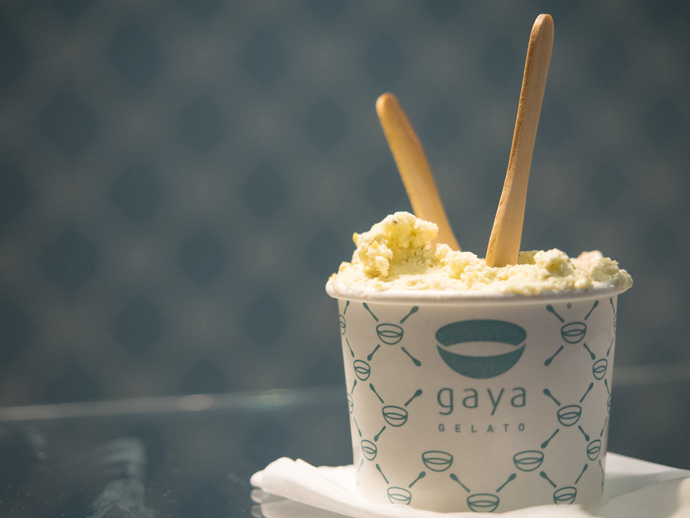 Our Favourite Gelato in Canggu, 100% natural 100% delicious. Great place for Indonesian food in Canggu. They also have deep fried oreos which we ordered out of curiosity and were pretty good actually. 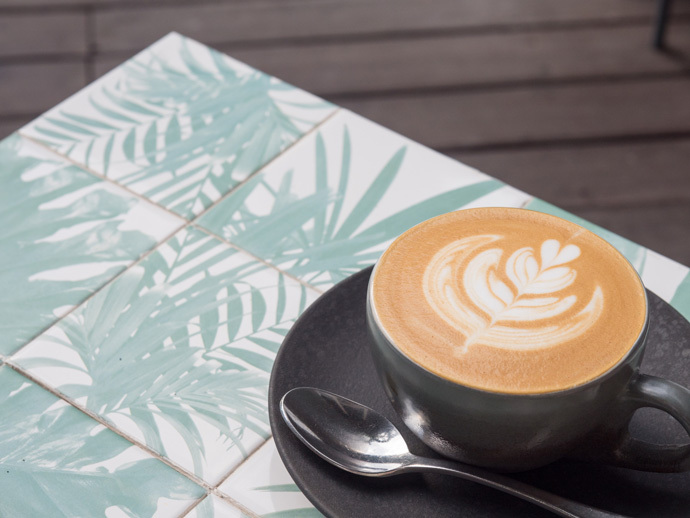 Deus Ex Machina is an icon in Canggu, that not only serves up food and drinks, but is a retail space, art gallery and much more. 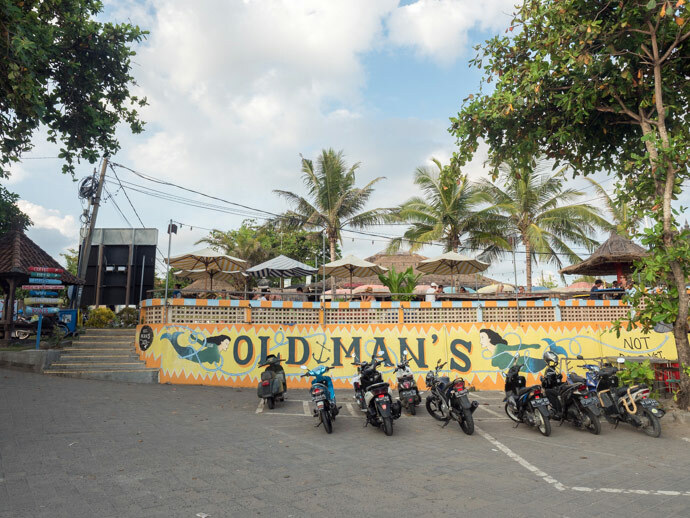 Old Man’s is the perfect place to spend your evenings, gather your friends and soak up the atmosphere. 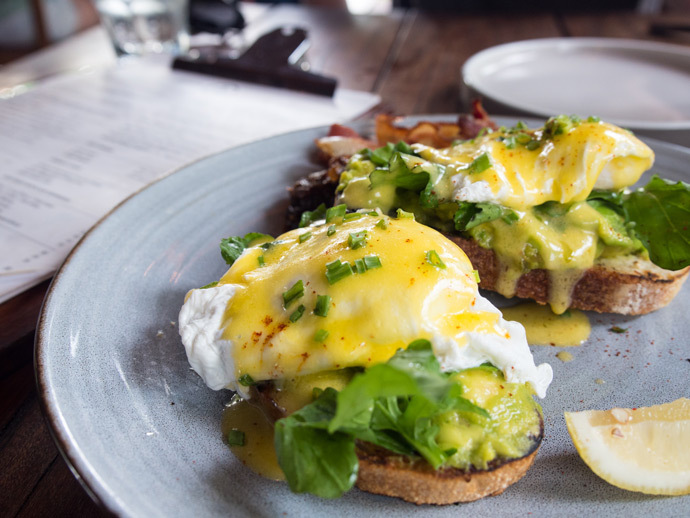 Located just off the beach, it’s a relaxed space that serves great food and drinks. Sometimes you just need dessert. 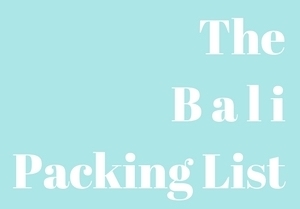 Or bakery products. Or Coffee. 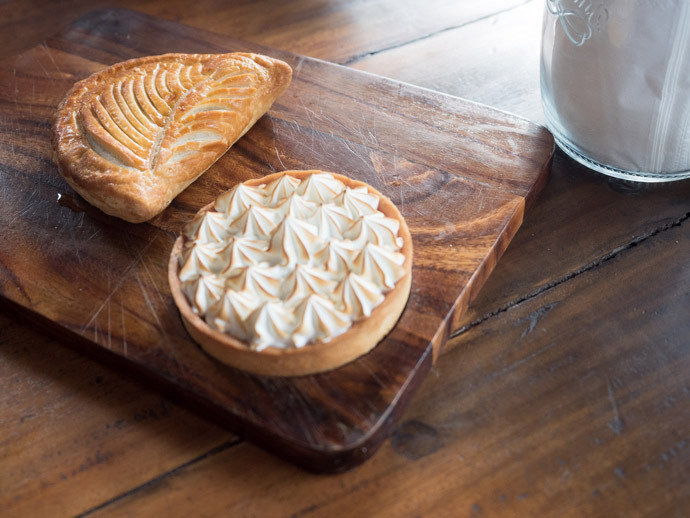 For these times, Monsieur Spoon should be your go to. 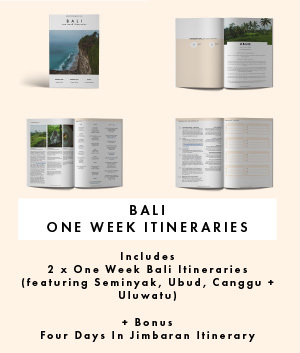 Going to Canggu? 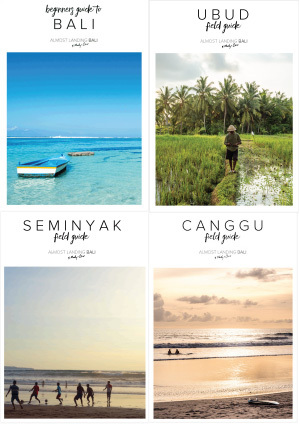 Take a look at our Canggu Field Guide ebook here. 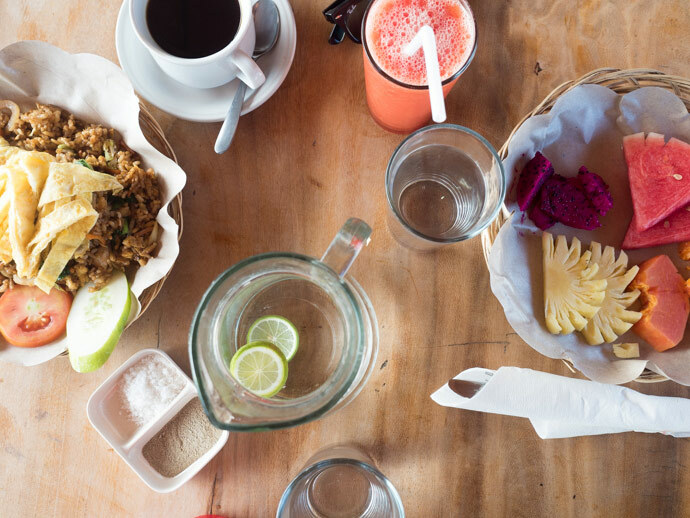 Where to eat in Canggu… what’s your pick? 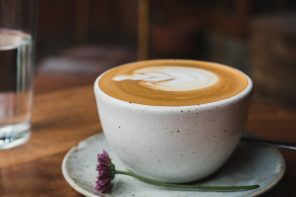 We were guests of Ji Restaurant Bali, but as always, all opinions are our own and only our favourite picks will be included in this article.